Born in Sandhult, Västergötland, Carolina Klüft grew up in Växjö, where her father, mother and three sisters still live. She currently lives in Karlskrona together with her boyfriend Patrik Kristiansson, who is a pole vaulter. When she's not training or competing she is a student at the University of Växjö, studying Peace and Development. She has visited areas of Sri Lanka hit by the 2004 Boxing Day Tsunami to make a film for Swedish TV and also sponsors children in Africa. Klüft is renowned for her friendly nature and exuberance when competing. This makes her very popular amongst fans and fellow athletes. She is particularly friendly with British rival Kelly Sotherton, and the two can often be seen chatting during competitions. Klüft regularly leads the other heptathletes on a lap of honour after a major competition. She is part of Reebok's "I am what I am" advertising campaign along with several other sports stars. She has been the focus of poster photography for Reebok, taken by celebrity photographer Jason Bell. Carolina has been nominated for three consecutive Laureus World Sportswoman of the Year awards from 2005-2007. Klüft was an exceptional junior, developing very quickly compared to most multi-event athletes. 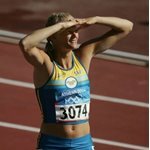 During the 2002 World Junior Championships in Athletics, at the age of 19, she set a world junior record by scoring 6,470 points. Less than a month later she bettered her record by winning the 2002 European Athletics Championships in Munich with a score of 6,542 points. By heptathlon standards Klüft has always been excellent in the jumping events and also in sprinting and hurdling. She has steadily improved in the throwing events and 800 m and now has no weak events. 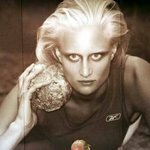 Klüft is one of very few athletes to at some time hold all five available international titles, Olympic, World Outdoor, Regional (Europe in her case) Outdoor, World Indoor and Regional Indoor. And at the age of 22 she was the youngest athlete ever to hold all five. 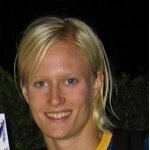 She has had regular success in indoor pentathlons, winning the 2003 World Indoor Championships and the European Indoor Championships in 2005 and 2007. Her pentathlon personal best of 4948 points ranks her second on the all-time list. Her victory in the 2007 European Indoor Championships in Birmingham was by a margin of only 17 points over home favourite Kelly Sotherton. Carolina competed in the long jump in the 2004 World Indoor Championships, winning a bronze medal. 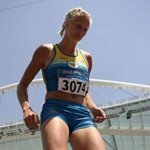 She chose not to compete at the 2006 World Indoor Championships in order to prepare for the European Championships in Gothenburg.